Nanoparticles are usually referred to as particles ranging in size from 1 to 100 nm. The field of nanoscience has emerged over the last 20 years and is still booming due to its wide range of applications in day to day life. Based on size, distribution and morphology, nanoparticles exhibit completely new or improved properties as compared to the properties of larger particles of bulk materials they are made of. With decreasing size of nanoparticles, these present a higher surface to volume ratio. Specific surface area is very important for antimicrobial, catalytic and various other properties attributed to nanoparticles. Thus, as specific surface area of nanoparticles increases, there is an increase in their biological effectiveness due to increase in surface energy . Metal nanoparticles are a subject of intense study due to their notable optical, electrical and catalytic properties. Size and shape of nanoparticles has been very important in tuning their physical, chemical and optical properties [2-4]. Synthesis of metal nanoparticles has been done by various physical and chemical properties some of which include lithography, laser ablation, ultrasonic fields, chemical reduction [5-8], electrochemical reduction [9,10], photochemical reduction [11,12], heat evaporation [13,14] etc. In the chemical methods, nanoparticles are prevented from aggregation by various surface passivator reagents such as thiophenol , thiourea , etc. which are toxic to the environment if nanoparticles are produced in bulk amounts. Therefore, for these reasons various biological methods have been employed for the synthesis of nanoparticles which are both sustainable and environment friendly. 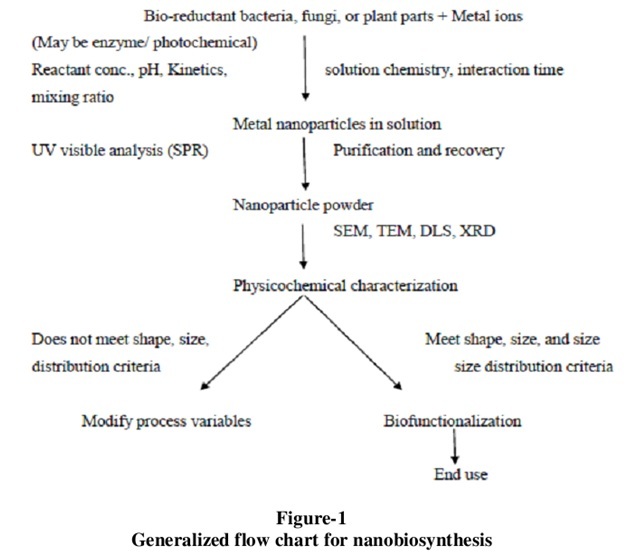 Biosynthesis of metal nanoparticles has developed considerable importance due to the emerging requirement for the development of environmentally non-toxic technologies in material sciences. One of the ways in which this can be done is by the use of microorganisms for synthesis of metal nanoparticles [17-22]. Both live and dead microorganisms have been employed for this relatively benign procedure. Among microorganisms, prokaryotic bacteria were the one which primarily gained attention due to their properties in synthesis and stabilization of nanoparticles in tandem and mild conditions. Klaus et al. described the formation of silver based particles at the cell poles of propagating Pseudomonas stutzeri AG259 . Eukaryotic organisms like Verticellium sp. have also been used for the synthesis of metal nanoparticles by Sastry and co-workers demonstrating shift from bacteria to fungi having the added advantage of processing and handling of biomass in a simpler way [24-25]. While microorganisms such as bacteria, fungi and actinomycetes continue to be of interest in synthesis of metal nanoparticles, the use of parts of whole plants in similar metal nanoparticle synthesis promises to be a more exciting possibility which is relatively under-exploited for the present time. Use of plant extract for the synthesis of metal nanoparticles can be advantageous over other biological methods due to the elimination of the elaborate process of maintaining cell cultures. Hence, various plants with medicinal properties have been exploited for the synthesis of metal nanoparticles such as gold, silver, copper, etc. Gold nanoparticles have advantages over other metal nanoparticles owing to their non-cytotoxicity and biocompatibility. It is used internally in humans from last 50 years due to the chemical inertness of these nanoparticles. Gold nanoparticles accumulate in tumor cells and show the property of optical scattering. Thus, these can be used as a probe for microscopic study of cancer cells. These are also used successfully in chemotherapy and diagnosis of cancer cells. These can also be used for drug, gene and protein delivery. Gold nanoparticles occur in various size ranges from 2 to 100nm. Particle size ranging from 20-50 nm show the most efficient cellular uptake while specific cell toxicity is shown by particles ranging from 40-50 nm. Gold nanoparticles also exhibit optical properties like plasmon resonance. They exhibit versatility because of their ready functionalization through thiol linkages. Also, these have high stability due to gold-sulphur bonds. Thus, gold nanoparticles are emerging as promising tools due to their multifunctionality, low inherent toxicity and other remarkable properties.